This project explores a novel approach to web-based self-diagnosis using multimedia databases. In contrast with many patient-informing sites available on the internet, this project allows patients to search for their skin lesions using an image of their skin rather than a textual query. 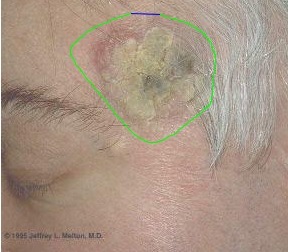 Users upload an image of their own and mark the diseased region in the image. The system then extracts visual features useful in the diagnosis of melanoma and returns results that are most similar to the query image. Naturally, self-diagnosis should never be a replacement for diagnosis by a physician. The system should be used to inform patients to better understand their doctors, never to to seek solutions to their symptoms on their own. carcinoma image © 1996-2008 Jeffrey Melton, M.D. The Multi-media Database for Self-Diagnosis of Skin Lesions Project has its own page. Visit it for a demo of the current system.